We give you winter tire tips. When to put them on, when to take them off, and ways to save money though all four seasons. The worst time to think about tires is when your car is skidding out of control down a slick winter road. The second worst time is when you are stuck at the bottom of an icy hill, trying to gain enough traction to get the car moving. So, let’s spend a few minutes talking over the idea of winter tires. What are they? Do you need them? If so, when should you put them on? Here are our winter tire tips. What’s the Difference Between All-Season, Mud & Snow and Winter Tires? With comparing modern tires, two considerations come into play; tread design and the softness (or hardness) of the tread’s rubber compound. What is so different about modern tires compared to the ones in use long ago? All tires then and now are round, black and have some type of tread design. The difference is internal, where you can’t see it. Up until the mid-1960s, tires were constructed with their internal cords running in a crisscross fashion. That gave the tires great strength, but also made their sidewalls very rigid and inflexible. When a vehicle cornered hard, since the tire didn’t flex very much, part of the tread would lift off the road. Obviously, that’s not good. The primary means of getting tires to make traction, then, was to use various tread designs, each one designed for a different type of road surface. Drivers had to match their tires to their driving habits as best they could, and then hope for the best. Nowadays, modern tires have their internal cords arranged next to each other side-to-side. That’s called a radial design. It makes the tire’s sidewall very flexible. That’s why radial tires appear to be low on air when the vehicle is parked, even though they are filled to the correct pressure. That flexibility in the tire’s sidewall keeps the tread in much better contact with the road surface as the vehicle is turned, steered and as it leans through corners. That new design also brought about the advent of all-season tires. Great for highway running, and nice to have in heavy rain, they are also good for the mild conditions of moderate winter climates. That means occasional light snow, salt and the dirt that highway crews put down to help traction. 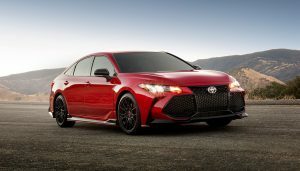 If that’s all you ever face, and only on an occasional basis, then your winter tire tips are that a good set of all-season tires might be what you need. So, the climate where you live is worse than that. No problem. Maybe you can step up to mud and snow tires and leave them on your vehicle all year round. No, you don’t have to install tires with horrific zig-zag tractor treads on your car. It’s not that drastic. You’ve seen mud and snow tires many times. They are commonly used on SUVs and light trucks. They have a very rugged-looking tread design. The tread pushes mud and snow into the big channels between them, and then as the wheel turns centrifugal force slings all that stuff out, behind the tire. 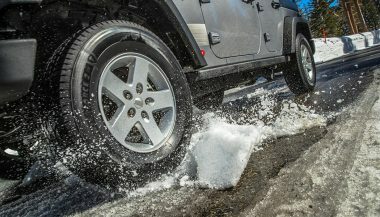 Because of their aggressive tread pattern, mud and snow tires make noise on dry pavement. It’s a humming sound (some people say annoying) that you have to get used to. They ride a little harsher too. Come on, it’s a heavy-duty tire, so it’s allowed to ride harsher. But these tires will get you through stuff that’s worse than the light snow we hoped for in the all-season tire example. Our winter tire tips are to look for tires that have the letters M & S molded on the sidewall, meaning, of course, mud and snow. If only things had been that simple in high-school algebra, right? If you own a snow shovel, a snow blower to clear your driveway and keep bags of salt in your garage, then you probably will want a nice set of winter tires. These are even more aggressive in tread design than mud and snow tires. Our winter tire tips are that if the winter is six months long where you live, and the days are long and dark, then these tires are for you. Look for the ‘winter tire’ symbol molded into the tire’s sidewall. The symbol looks like a mountain with a snowflake on it. You would think that summer tires would have a palm tree, maybe with a pair of sunglasses, molded on to them, but they don’t. Go figure. When Is the Best Time to Install Your Winter Tires? 40 degrees and lower; remember that number. 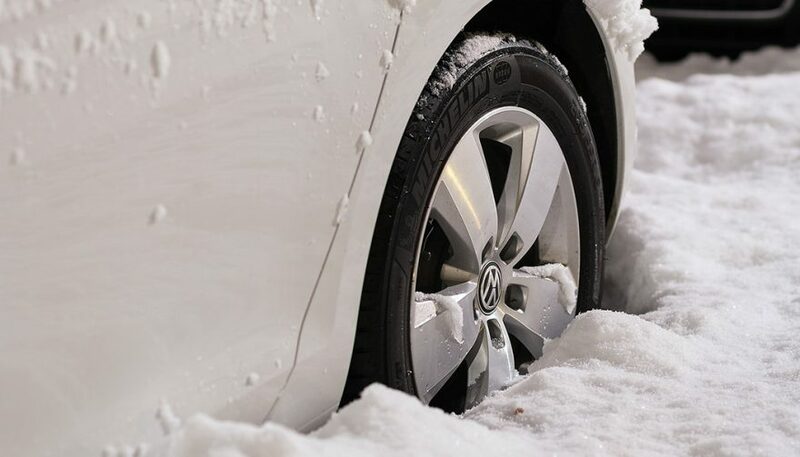 When the average daily temperature falls lower than that, your all-season tires’ hard rubber compound will get even harder, and therefore more resistant to traction on snow, slush, ice, and freezing rain. At that point, have your winter tires put on the car. Keep the other ones aired up, clean and stored inside, preferably in your garage. How Long Should You Leave Winter Tires on Your Car? Soft rubber compounds; remember that term as well. Winter tires have a softer tread makeup, which gives them better traction in cold temperatures. But that soft compound will make them wear out much faster in warm weather. That’s wasteful, so don’t leave winter tires on your vehicle longer than you need them. 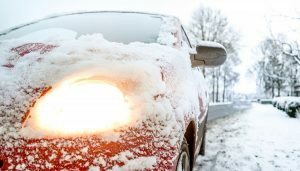 Our winter tire tips here are that when the average daily temperature rises back up above 40 degrees, put your other tires on. New Wheels for Your Winter Tires? Think about this: You have a nice set of good-looking custom wheels on your car. Do you want those expensive wheels exposed to the road salt, ice, mud, and slush of winter driving? Probably not. Look at the cost of having tires installed and balanced. Every winter you have your tires switched, summer tires for your winter tires, and vice versa. That costs money each time you do that. After a while, you have to think “Is it cheaper just to leave the winter tires on steel wheels that have hubcaps? You save in labor and keep your nice wheels away from salt and all that stuff. Resist the temptation to buy winter tires for only two wheels. A popular argument is to place the tires with the best traction on the front wheels, the ones which do the steering. After all, that’s what 18-wheelers do. But if you do that, what will happen? When you slam on the brakes on a slick road, and the front tires bite, the back tires will skid. The car will start to turn sideways as it slides down the road. 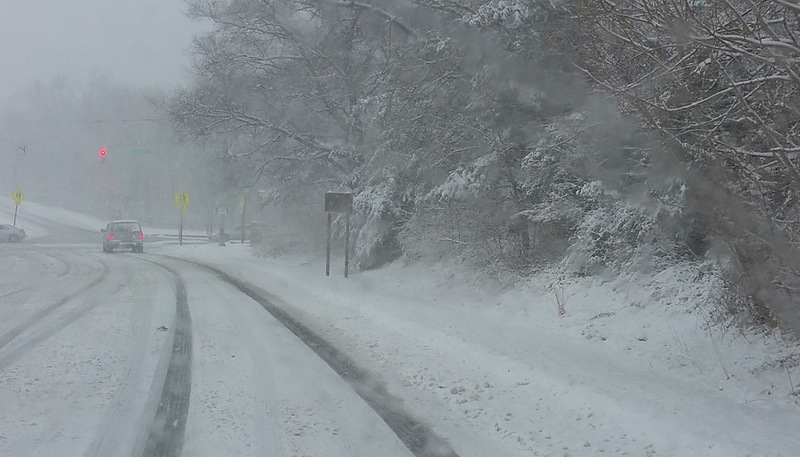 At that point, when the back of the car passes the front, you will wish you had put winter tires on all four wheels. Plus, your car doesn’t have 16 more wheels out back to do the braking and to keep the vehicle pointed straight as you desperately try to slow it down. So our winter tire tips here are to put winter tires on all four corners. Winter road conditions can be tough on a car not to mention their owners. That's why you need the best snow tires. Here's how to find them. Are You Wasting Money on High Octane Gas? 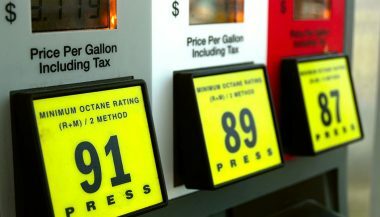 Premium vs regular gas, which is better? A lot of people think higher octane yields better performance, but that's not really how it works. You know what the gas and brake pedals do, but other situations aren't as black and white in traffic. Here are few driving tips for beginners to help out.